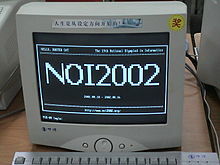 A computer monitor or a computer display is an electronic visual display for computers. A monitor usually comprises the display device, circuitry, casing, and power supply. The display device in modern monitors is typically a thin film transistor liquid crystal display or a flat panel LED display, while older monitors used a cathode ray tubes . It can be connected to the computer via VGA, DVI, HDMI, DisplayPort, Thunderbolt, LVDS or other proprietary connectors and signals.